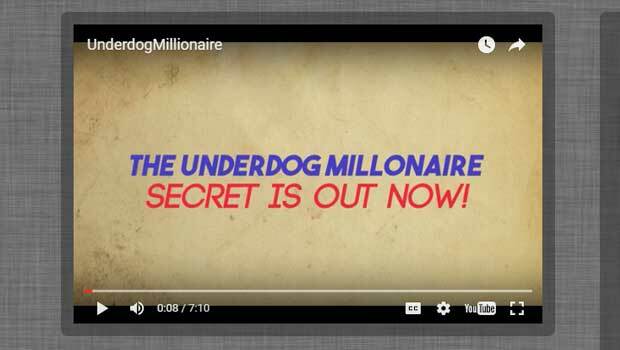 The underdog millionaire is a new binary options software by Albert Friedemann. Albert is a self-proclaimed German genius that has come up with a software that boasts a 95% winning ratio. Like most binary options products this one is being offered for free as long as you deposit money with their preferred binary options brokerage. Today I will be reviewing this software and letting you know if it’s a worthwhile trading endeavor. The underdog millionaire website is very simple and does not provide the amount of information I require to make an informed decision. There is a 7 minute video, an email subscription form and 3 sentences. In the 3rd sentence, Albert promises that his system “will provide u with a professional and easy to understand trading environment.” I’m not sure about you, but when I’m looking to invest thousands of dollars I am certainly not comfortable with a product developer that uses “u” instead of you. The fact that Albert claims that the environment is professional yet in the same sentence uses a short form of a word used primarily by 12-year-old girls is concerning to me. The results on the underdog millionaire website are equally as underwhelming. We are shown multiple screenshots that are supposed to prove the performance of the software. Yet, if you look closely at these images provided in the video they start looking falsified. While the balance is increasing, everything else is staying the same. We can see that the market isn’t moving at all in these screen shots but Albert keeps showing his account balance going up. This makes me believe that these screenshots are falsified and considering they are the only evidence being provided, that’s a bad sign. I am not going to be recommending the underdog millionaire to any of the binary today readers. I don’t feel as if the software has the binary options community’s best interests at heart. I don’t believe that the developer is trustworthy or professional despite trying to claim so multiple times. Please let me know what you think about the software by leaving your comments and questions below the article now. As always, this webpage is an open place for your contributions so please don’t be shy. I look forward to hearing from you and hope that this review is helped you make the right decision regarding this new application.